So this is the final painting of the challenge. Meet ‘Mr T’ who is owned by my friend, Caz. We have enjoyed many hacks out together over the pass few years and I am so grateful to Caz for giving me the opportunity to ride him at times when I had no horse to ride. I produced a pencil drawing of ‘T’ for one of my 100 day challenge pieces two years ago and thought it would finish the 30 day challenge off nicely if I were to finally depict him in paint. With this one being the final painting, it has made me think about what I’ve learnt from the project. I had only made the progression from pencil to paint just over a year ago and felt that I had a long way to go in terms of learning about colour and how to use oils properly. So when Jane asked me if I’d like to take part in a painting challenge I jumped at the chance as I knew it would be a good learning curve but deep down I had doubts as to whether I could actually do it. I felt completely comfortable using oils from the very beginning of the challenge and knew that this medium was the right one for me but was worried about the drying times and whether I could get one done in a day. The project allowed me to get to grips with how they worked, what effects could be made and just how quickly I could paint with them. I found that by using them thinly and using a quick drying medium with the paint, it enabled me to complete them quite easily within a day. After painting for an entire month with oils I have fallen in love with them even more and now feel I’m beginning to find my own style, a style which I can now start to build upon in future works. Colour was also an issue and I truly believed that it would become a problem for me once the challenge had started. For years I have been daunted by colour with colour mixing being the scariest thing of all for me together with what colours to put down in a painting instead of just one colour alone. To my amazement, the more I started to ‘look’ at what i was painting, the more colours I was seeing. I felt like I had had a lightbulb moment and realised that I hadn’t been ‘looking’ at things properly. Since the challenge Ican now see all sorts of different colours around me and I really enjoy trying to work out what paint colours I’d use to recreate certain objects, especially when I’m out walking. It really is as though a veil has been lifted from my eyes and I can finally see things properly. I would say this is one of the greatest achievements I have gained from doing this challenge. The 30 day challenge has been an incredible journey for both Jane and I and it has helped us both to progress in different ways. I would certainly recommend that all artists set themselves at least one challenge a year to help develop their work. I would just like to take this opportunity to say a huge thank you to Jane for asking me to paint alongside her, it truly was an absolute pleasure. I would also like to say thank you to all of our Facebook fans for supporting us and for taking the time to like and comment on our posts. It is such a fabulous feeling to know that so many people appreciate what we do and we can’t thank you enough. Low resolution images are used for each painting day, this is to help to prevent unauthorised usage and downloading, hence the colours may vary slightly from that of the original. A higher resolution image is available to view if you may be interested in purchase. Please contact Roxanne on the above email for further details. all comments and support gratefully received……..
Watercolour, pencil and charcoal on watercolour paper. I’m really enjoying exploring watercolours with pencil and charcoal at the moment so for tonights piece I decided to use the medium again. I’ve wanted to use this photo of Jane’s for ages and have finally got around to doing something with it. Jane took a series of photos of the ‘Equicirque’ in London. They are a company who put on magnificent equestrian shows and tour around the world with their productions. This particular horse and rider were from an act called ‘Los Rios’ and apparently the girl was only 15 years old! By using a limited colour palette and being quite bold with the paint application, the image has been simplified which I think works well. 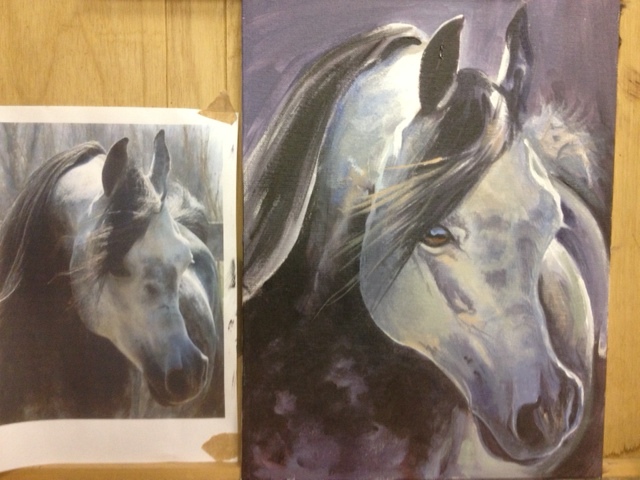 The horse is actually grey but because i forced myself to use just a few colours I have re-created it in my own way. 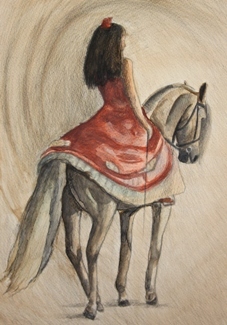 The angle of the horse and rider makes it an interesting piece and adds that element of mystery. 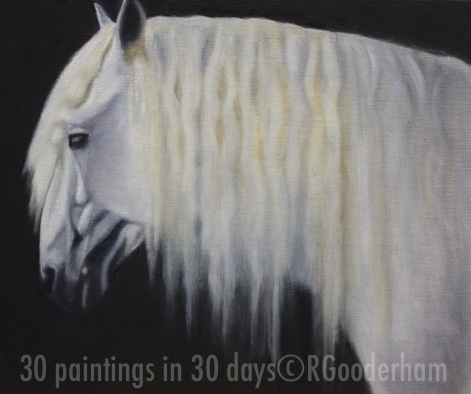 For day 26 I decided to use another fabulous photo of Lorenzos grey horses taken by Jane but this time I didn’t want it to look exactly like the photo. I wanted to stylise the horse and make it my own. The photo itself is very ethereal and as I am a huge Pre-Raphaelite fan i looked to Burne-Jones for a little inspiration. I am always drawn to his watercolour studies and the way he uses those rich, and sometimes subtle, blues and warm earthy colours. Limiting my pallette, I feel, works well for this piece. i kept the painting quite loose and i let the drips go wherever they wanted to go. I love this way of working and working ‘with’ the paint rather than going against it. Working with it can lead to some unusual and unique paintings. The headcollar was a patterned blue nylon so I substituted for a leather look, removed the lead rope and allowed the lovely linen finish of the canvas to become a very quiet and simple background….. Purchases available through Paypal or by personal cheque. Deposit secures. Installment plan available. If you are interested in making a purchase, please contact me either by text or email. 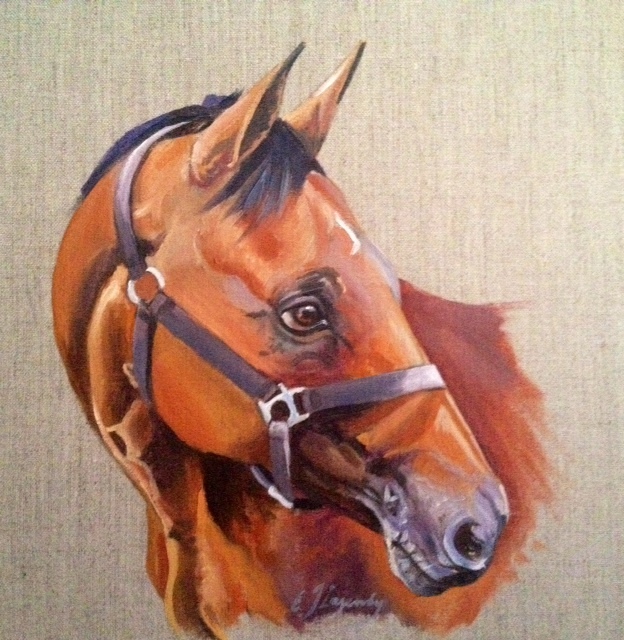 Today has been a ‘finishing off a painting day’ for me. I’ve had this painting sitting in my studio for months and was in the very early stages of progress. I thought it was about time I got around to completing it so I have used the painting challenge to help push me forward with it. This gorgeous Spanish stallion is owned by a Facebook friend of mine and they kindly gave me permission to use their photo. The peacefulness of the horse attracted me to the image straight away. It has that medieval feel to it which I am always drawn to. I could have gone into detail and defined each and every wave of the mane but I didn’t want it to look exactly like the photo so I changed it and blended the yellows and the blues together creating more of a blurred effect, which I feel gives more of an ethereal quality to it. 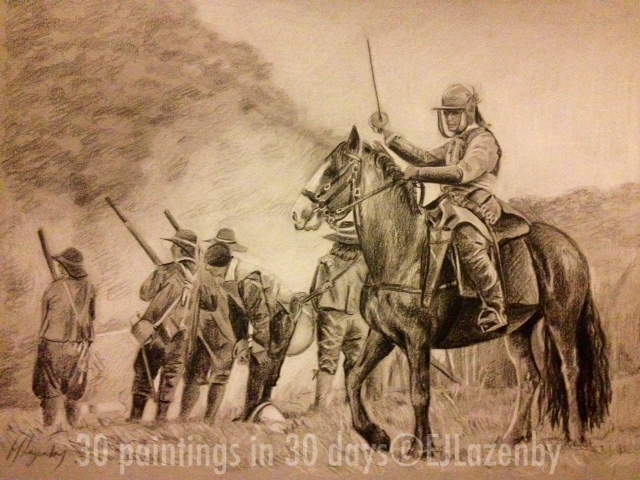 Today has been confined to drawing media due to the confinement of the train journeys, but as I have been quietly absorbed entertaining my fellow passengers, the hours have flown by and this pencil study shall emerge shortly as a full colour painting – I’ve taken out more soldiers, changed the colour of the horse, restructured the background and generally given it a good shake up from the image in the reference photo…. The Medieval period!…sigh! I am absolutely OBSESSED with it! The horses, the romance, the clothes, everything! Like the Civil War, I have been interested in all things medieval since I was a child and again, it stems from when my dad used to take us to look at old ruined castles where there would be re-enactment groups which brought the history to life. I guess it has all just remained with me ever since. A Facebook friend of mine has very kindly allowed me to use her wonderful photo of her and her horse. 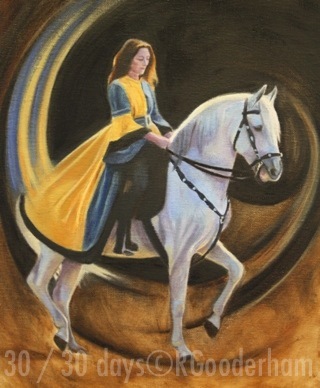 Both horse and rider look absolutely stunning and I couldn’t resist painting it. I’ve been meaning to get around to creating a painting such as this for months and this challenge has allowed me to make a start on what will be an ongoing project. I’m really enjoying these swirling backgrounds and each time I do them I feel they are becoming more effective. I will keep experimenting with the idea. My last demonstration at this club I completed a detailed portrait of a wee Pekingese dog owned by one of the audience. 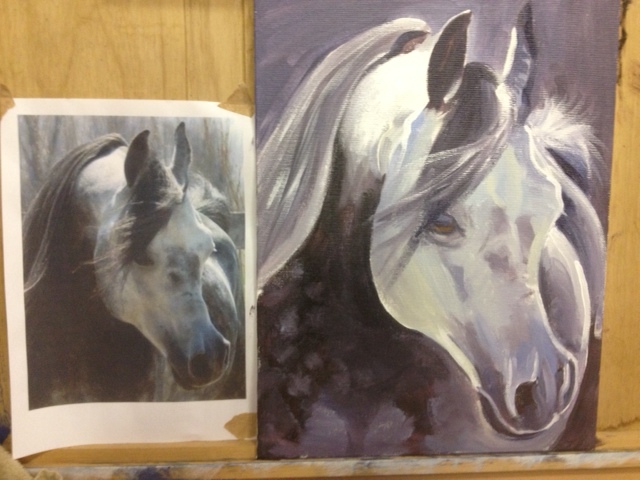 Tonight I had been asked to paint a horse in acrylics, and I knew the one I wanted to work on! 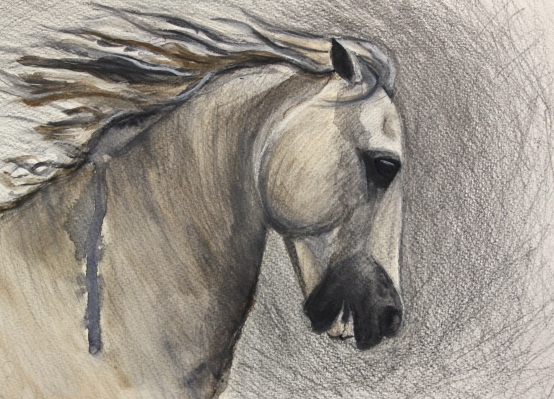 I’d come across a photo quite recently of a lovely grey Arabian stallion, all arched neck and flying mane – he would make an eye catching painting and also a chance to draw the basics with a few sweeping lines, to increase the colour in shadow and to use a loose technique with little detail – 2 hours goes very fast when you are sat at an easel with an audience asking questions! This Art Group has a very professional set up – camera trained on my painting and projected onto a cinema wall! So I was viewing my own work at about 8 foot tall! Upon completing the painting and returning home, I wondered if I should refine some areas of the painting, but upon reflection, I decided that I would only fiddle and may spoil some of that energy and flow within the painting….. I just can’t believe it is day 20! Time has flown so quickly! 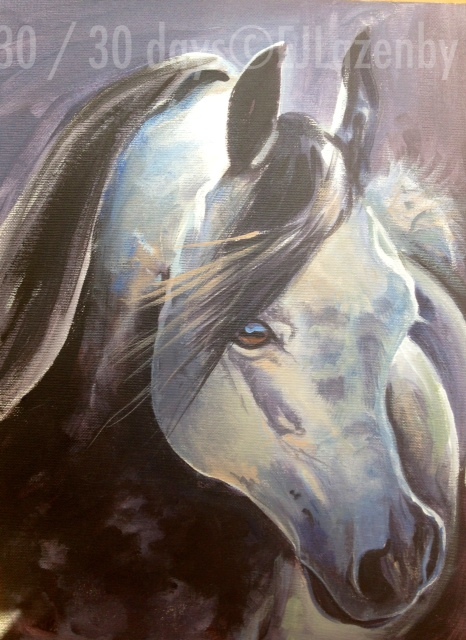 Today i have finally got around to painting this gorgeous shire x, Duchess, whose photo was donated to us on our facebook page by her owner. I really enjoyed painting her bright bay coat. I could see pinks, purples, blues, ochres. It’s amazing just how many colours you begin to notice once you start to ‘look’ more at something. Colour used to scare me but now I have so much more confidence and want to learn more about the subject. Again, I have tried to experiment with the background with this one to make the painting a bit different and to add a little atmosphere and interest. I’m really liking using this technique. 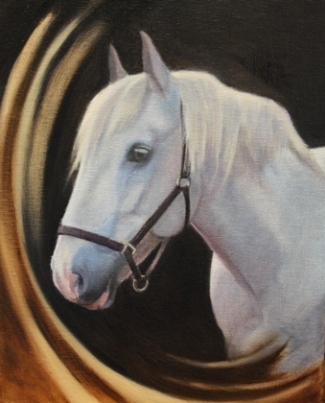 This oil on canvas panel is painted from life, it shows our little mare, Clivocast Shelby, who is sadly leaving us this week and going back to her owner as we have lost our grazing. 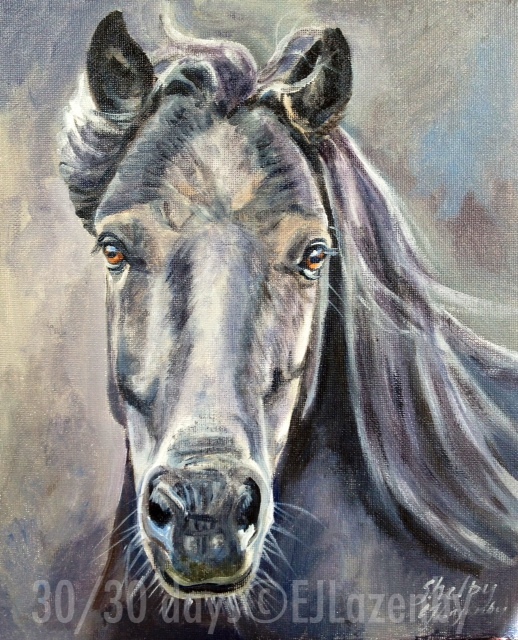 I’m sad to see her go, so this painting I did for her… She is such a bright eyed little poser and will stand at the gate for hours in the hope of a treat! It was a simple job to take the easel and paints up to the field and work loosely keeping the colour palette cool blues and greys… I brought the painting home after 2 hours as the flies started to stick to the paint (now tweezered off) and added a few more darks and details from memory…. The reason of painting from life today is an interesting one………. My blog received a comment a couple of days ago that got me thinking…. Do I copy photos, do I change the photos enough (backgrounds, colours, combine 3 or 4 together…?) Am I guilty of being only a copyist? Why do I work in a Traditional and figurative way? ( I did do a series of more abstract works as a student and then later in my 20’s), Is my work too safe and boring??? To an artist that has done a 4 year degree and then 20 years self employed as a professional painter, what ‘new’ things are left??? So here I am, doing what I love doing, in a style which I have found over 25 years of painting suits me perfectly, working from life, memory AND photograph….. 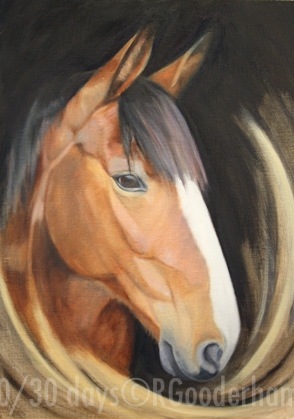 Mainly painting horses, but happy painting nudes, dogs, cats, wildlife, landscapes, portraits…. 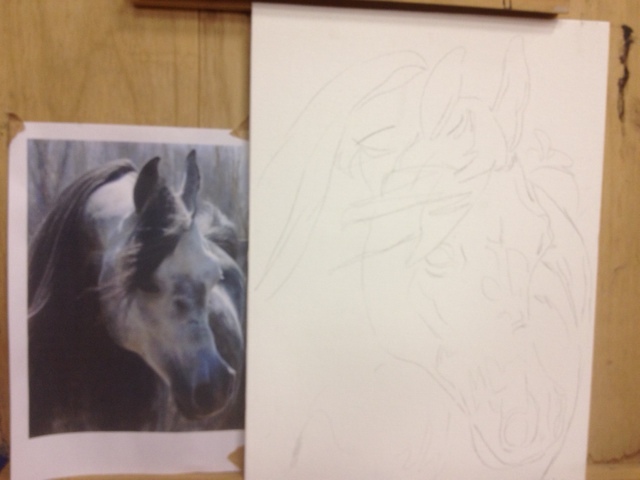 I like things to look in proportion and have correct form – elongated and deformed horses don’t float my boat under the name of ‘stylised’ or ‘modern’… to me they are just badly painted…Rant over! These remarks are not aimed at anybody, but I feel a little more justified doing what I do and being happy within my own rules…..